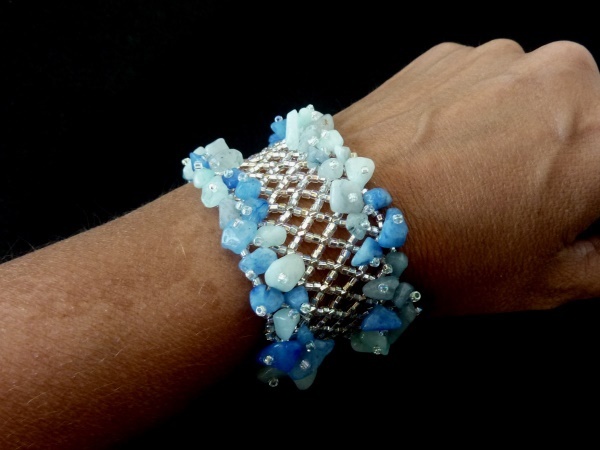 This stunning beaded lattice cuff tutorial is by NatiBeads, especially when worn. A vision in two colors of 4 mm Swarovski crystals! The crystals sit on top of the lattice spaces. The design also uses 11/0 and 15/0 seed beads. The tutorial is in Spanish but you can follow the pattern by watching the video carefully. It is not particularly difficult - just needs some patience as you are working with small seed beads! Prefer something quicker? Juliette demos Spoilt Rotten Beads' Lattice Cuff tutorial using 8/0 beads as well as 4 mm pearls and 4 mm round fire polished beads. This one is ideal for beginners. Another lattice cuff tutorial is this gemstone chip edged one from Bead Diagrams!